Tulbagh lies in a beautiful ‘hidden valley’ surrounded by the Winterhoek, Witzenberg and Obiqua Mountains. 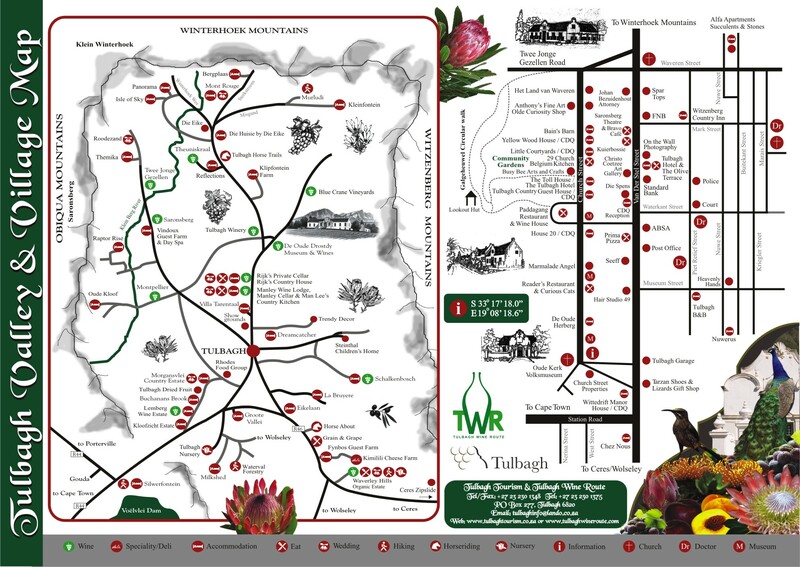 The Tulbagh Valley is at the western end of the famous Route 62, which meanders through all the wine land areas of the Western Cape and Karoo. If you are looking for beautiful countryside and magnificent scenery then Tulbagh is the place to visit. Whether you go for gentle walks or hike up the mountains; horse ride through the valley; visit wine cellars or fruit and olive farms, there is plenty to keep you occupied. It’s a busy little town that has many festivals and shows such as the Spring Arts Festival and Tulbagh Agricultural Horse and Wildflower Show, in addition to many wine festivals and even celebrating Christmas in winter. There always seems to be something going on in Tulbagh! Keep an eye on their Facebook page. 1. Historical Tour: Discovered in 1658, Tulbagh is full of history. With wide streets to walk and explore. Visit the museum church (1743), or any one of the 32 National monuments on Church Street. 2. Moniki Chocolatier, situated in Church Street at the old Paddagang building together with Tulbagh Winery. Chocolate tastings are combined with wine and port. 3. Wine farm visits are always a Tulbagh favourite as amazing red, white, rosé and sparkling wines are produced in the perfect grape climate and soils in this valley. Tasting and cellar visits are a must do on the local farms in the area that include amongst others, Schalkenbosch Wine Estate, Saronsberg, Tulbagh Winery, and Blue Crane Vineyards. 4. Spend a few days in Tulbagh in one of the many accommodation venues from hotels, spas, cottages and self-catering homes. While you are there, take in the breath-taking beauty of the Obiqua, Winterhoek and Witzenhoek mountain ranges that surround the village. Walking, hiking and mountain biking is a great way to enjoy the scenery that is Tulbagh. 5. Get married in Tulbagh! So rent a car from CABS car hire and visit the Winelands for any reason you can make up! It will be worth it.